Along with any other songs you believe is the song of 2018. Should point out Muse/ST has not had any airplay this year, so up to you. Link provides all the voting details. Voted for Supremacy, only great Muse song in the list that you could vote for. You're from Brisbane, where's Wake Up by DLC? Voting closes this Sunday at midnight AEST! Be sure to vote. My list, in no particular order. ... left it until the last minute and didn't get to vote for anything else for fear of not making the time. So many Australian bitching about Madness on twitter. The no.1 song is abysmal. The 'Hottest 200' is being played over the weekend, so there's a high chance of a couple more Muse songs making it into that. Agree with the rest of you though; terrible countdown this year. 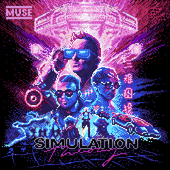 Hopefully Supremacy and Panic Station will place tomorrow! So, no Muse at all in the 200-101 list... This really surprises me. The reactions to T2L from people I know who listen to Triple J were all mostly "at least it's better than The Resistance" yet The Resistance ended up with 8 songs between 200-1. I guess the difference between both albums is probably the fact Uprising was a good lead single, and UD was extremely popular here too. Does this mean that Muse' popularity in Australia has lessoned? If so good, makes for better gigs when they come here. Bump for Drones. Link in first post.